"I still expect to see Peter revving up his car or that..."
"With tears running down my cheeks, it is nearly impossible..."
"I love you Peter. I'm deeply grateful to have been part of..."
"Losing a loved one unexpectedly is never easy. 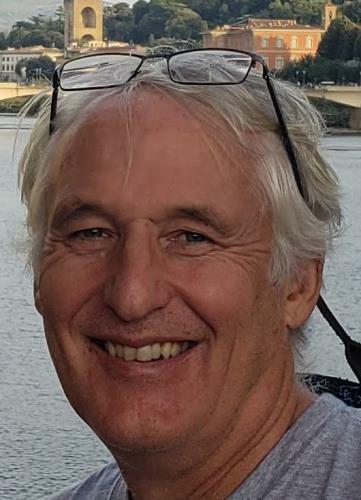 But our God..."
"I will remember Peter always as a dear friend and amazing..."
Peter John Wilson Lamb died unexpectedly on January 21, 2019. He collapsed while repairing his sailboat, while docked in Dania Beach, Florida. Although CPR was given immediately by a trusted friend, and he was transported quickly by ambulance, he never recovered.Peter was born October 22, 1958, in San Diego, California, the son of the late Captain William E. Lamb and Maureen T. Lamb. His father's Navy career took Peter and his family to many parts of the country. Although his growing up years included time in California, New York and North Carolina, the family always returned to Annapolis, which was the place Peter called home. After his dad's retirement, the Lambs restored an old farmhouse in Ulmstead, where Peter and his sister grew up riding horses through fields that are now peopled with houses and families. Memories of swimming his horse, Copper Penny, into the Magothy River brought happy tears to his eyes decades later. As a downtown Annapolis resident for the past decade, Peter took enormous pride in the place he considered home. Walking the dogs each day on its brick sidewalks gave him the time to appreciate its history and opportunities to meet neighbors whom he helped knit into a special village – one that will truly miss him.Peter graduated from Severna Park High School in 1976 and from Lynchburg College in 1980. While there, he met Carol Summers, whom he married upon his graduation. His career took them to Texas, Germany and California before returning to Severna Park, where they raised their three children, Anya, Andrew and Julia.Although their marriage ended in divorce, Peter and Carol continued as loving partners in the journey of parenthood – sharing joys and challenges, and spending time together with their children over board games and family meals. Those meals did far more than provide sustenance. Peter and Carol used such times together with their children to debate issues, encourage intellectual curiosity and support each other in the pursuit of a deeper understanding of life.Peter loved his children more than life itself, and particularly appreciated exploring new parts of the world together. As a father, he consistently encouraged them to grow and reflect on their own lives. Peter broadened the meaning of "family" when he reached out to mentor a young child named Joevon Reddon. Over the next twenty years, they became connected like father and son.During his years in Maryland, Peter was an active member of the Unitarian Universalist Church of Annapolis, at times serving as its President, a leader of the Coming of Age program, a lay minister, and the facilitator of its men's group. The men's group was the wellspring of many of his most enduring friendships and provided him the unshakable conviction of the importance for men of sharing deeply and unreservedly of themselves and their emotions. It made him a wiser, more loving soul, and the fellowship gave him immeasurable joy. His spiritual journey led him to follow the Buddhist religion. Its core tenet of gratitude became the true north of his world view and enabled him to live genuinely in the moment.As a young child, Peter was the original nerd. At the age of 14, when he learned that the Smithsonian had rolled out its first chess-playing computer, he set out to make a better program. Upon graduation from Lynchburg, Peter embarked on what would become a 37-year career supporting our nation's defense industry with the highest-level computer technology. Beginning with Digital Equipment, he navigated a succession of corporate mergers and ultimately was paid by Compaq, Hewlett-Packard and Hewlett-Packard Enterprise. He retired in October 2017 after leading a team that supported the National Reconnaissance Organization.Retirement brought Peter great joy as well as his share of challenges, mostly in the form of his Hylas 46 sailboat, which he named in loving memory of his mother, former Anne Arundel County Council member Maureen Lamb. From the day he bought Sweet Maureen in December 2015, she became his passion. A sailor since his youth, Peter really came into his own as her captain. With his partner Michele at his side, Peter sailed and explored his beloved Chesapeake Bay and visited ports from Rhode Island to the Bahamas. Sweet Maureen required Peter to apply his technological savvy, mechanical skills, leadership and stamina while sailing in unfamiliar blue waters. She also fed his zest for adventure and brought him joy as he met people, established new friendships, and learned their stories. Sweet Maureen also brought him internet fame, when a humorous, touching video of his rescue of a drowning baby raccoon went viral, garnering more than 650,000 views.Peter was graced by a unique gift of self-reflection and a magnetic personality that inspired the same in those around him. Sixty years young, he never lost the enthusiasm for life and new experiences, and he welcomed the challenges and the satisfaction that came from a lifelong journey of personal growth.Peter is survived by his siblings, Carol Lamb Hopkins of Cuernavaca, Mexico, Bill Lamb and his wife Jenny Spivak Lamb of Lebanon, NH and Maureen Lamb and her husband Tad Weems of San Jose, CA; his children Anya Lamb of San Francisco, CA, Andrew Lamb and his wife Caitlin Watts-Fitzgerald of Silver Spring, MD, and Julia Lamb of Austin, TX; the son of his soul, Joevon Reddon of Glen Burnie, MD; and numerous cousins, nieces and nephews. He is also survived by his loving partner of four years, Michele Ward of Annapolis, MD, and her three daughters, Emily, Madeline and Lydia Hoffman.A celebration of Peter's life will be held at the Unitarian Universalist Church of Annapolis, 333 Dubois Road, on February 23, 2019 at 1:00 pm. If you will be joining us for this celebration, feel free to leave the black clothes of mourning at home. In lieu of flowers, Peter would be happy to be remembered by donations to the Lighthouse Shelter in Annapolis or the Chesapeake Bay Foundation.